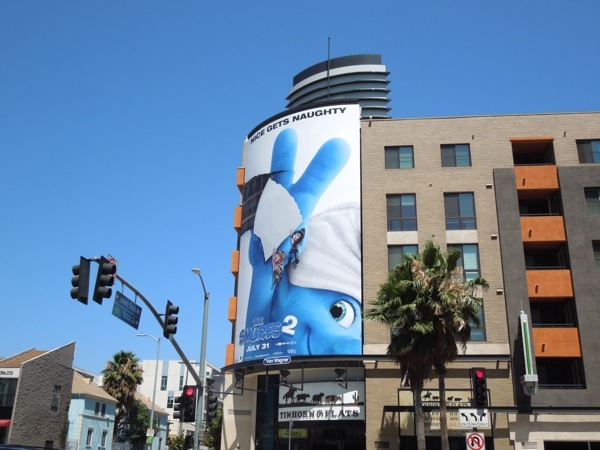 The skies of L.A. are even bluer at the moment with the return of The Smurfs to the city's skyline. 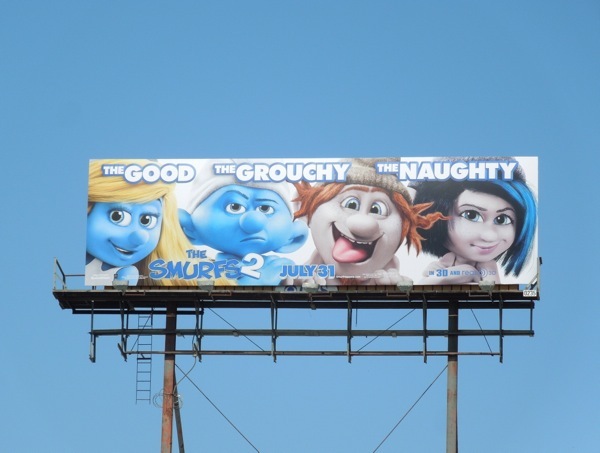 In this sequel to their first big screen outing in 2011, the beloved tiny blue-skinned Belgian creations face off once again with the evil 'Gargamel' and his newest creations, 'The Naughties'. The computer-animated Smurfs must team up with their real-world human friends, Neil Patrick Harris and Jayma Mays, to save Smurfette from the wizard's latest nefarious scheme. Can Papa Smurf, Brainy, Gutsy, Clumsy, Vanity and Grouchy save their blond-haired gal pal before she turns naughty? 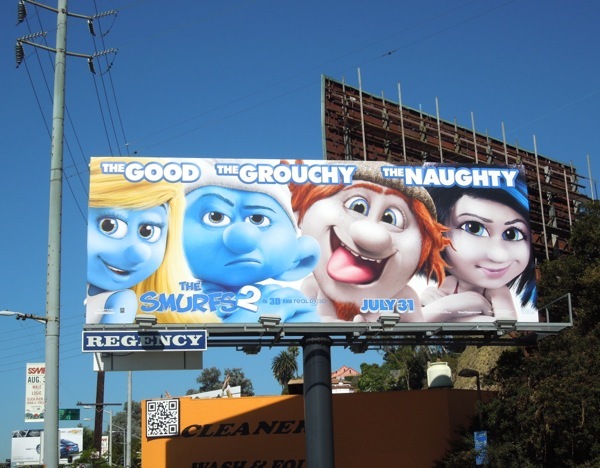 Sounds like this film is definitely one for the kids, but that doesn't mean everyone can't enjoy the billboards, especially the fun peeling poster creative (those mischievous Vexy and Hackus are so naughty). 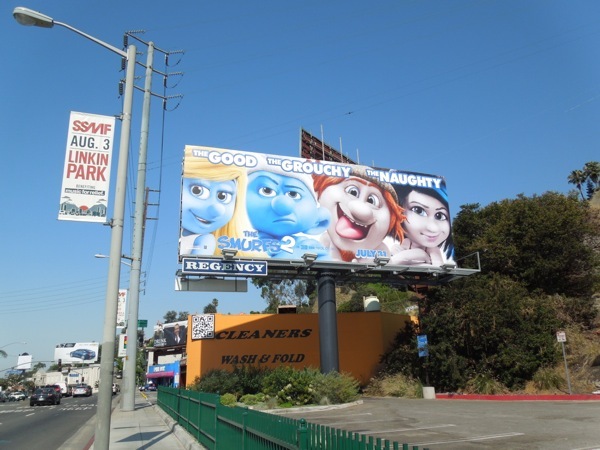 'The Good, The Grouchy and The Naughty' ad creative was spied along Sunset Boulevard and Wilshire Boulevard on July 2, whilst the larger 'Nice gets Naughty' version for The Smurfs 2 was snapped along Highland Avenue in Hollywood on July 7, 2013. 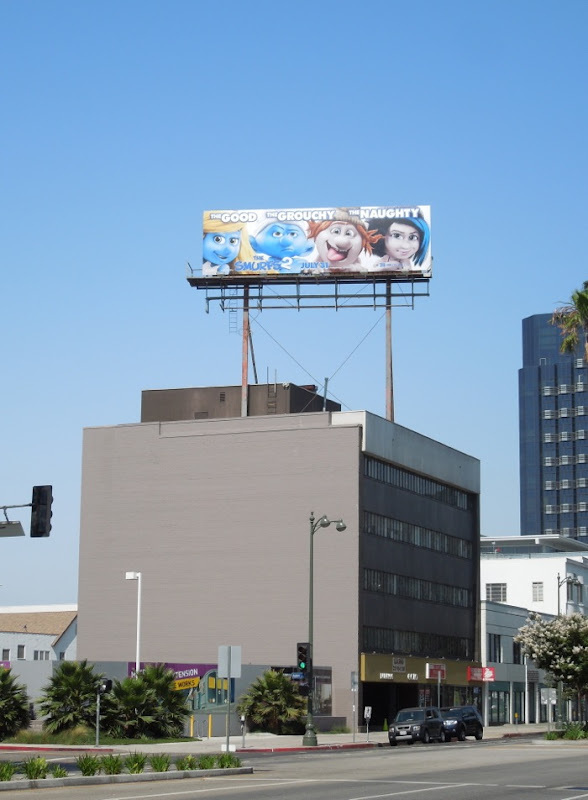 If you like these ads, then be sure to take a look at the billboards for The Smurfs first movie, especially the homage to the iconic 'Lunchtime atop a skyscraper' photo.